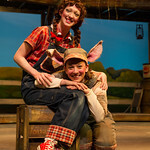 Charlotte’ s Web , a beloved children’s classic, spins the tale of a clever spider and her pig friend Wilbur. This play brings to life the friendships of Charlotte — the wise spider, her animal friends, and the young girl Fern. Using teamwork, the animals come together to save Wilbur and make him “ some pig” indeed. 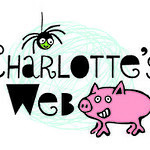 NOTE: Performances of Charlotte’s Web scheduled for December 15, 2015 have been canceled due to snow. If you had a ticket for one of these shows, contact the Arvada Center box office at 720-898-7200 for more information. Dec 19 Saturday 11:00 a.m.
Dec 19 Saturday 1:00 p.m.
Dec 20 Sunday 11:00 a.m.
Dec 20 Sunday 1:00 p.m.
Dec 22 Tuesday 11:00 a.m.
Dec 22 Tuesday 1:00 p.m.
Dec 23 Wednesday 11:00 a.m.
Dec 23 Wednesday 1:00 p.m.
Dec 26 Saturday 11:00 a.m.
Dec 26 Saturday 1:00 p.m.
Dec 27 Sunday 11:00 a.m.
Dec 27 Sunday 1:00 p.m.
Dec 28 Monday 11:00 a.m.
Dec 28 Monday 1:00 p.m.
Dec 29 Tuesday 11:00 a.m.
Dec 29 Tuesday 1:00 p.m.
Dec 30 Wednesday 11:00 a.m.
Dec 30 Wednesday 1:00 p.m. Throughout the school year, the Arvada Center offers several performances of this unique art form so children with special needs can enjoy and participate in live theatre alongside their peers. Shadow-interpreted theatre utilizes specially trained American Sign Language (ASL) interpreters to perform as “ shadows” on stage alongside actors. Shadow theatre marries sign language with choreographed movement, allowing the sign language to become a seamless part of the theatre experience. In this way, audience members who are deaf, hard of hearing or language delayed can simultaneously see and “ hear” the complete theatre performance in the same way as hearing audiences. Shadow theatre is also enjoyed by hearing audiences as an innovative art form and educational opportunity. Similar to watching a film with subtitles, viewers benefit from a rich bilingual experience and gain an appreciation for another language. We also offer performances that are audio-described for visually impaired patrons.